Rent The Arbors Events | Corporate Events | Wedding Locations, Event Spaces and Party Venues. The Arbors is located on a 112-acre tree farm in western Rowan County. The farm began growing trees in 2003 and has matured over the years to become a beautiful landmark just outside the small town of Cleveland, NC. The farm is 15 minutes from Mooresville, NC and 45 minutes north of Charlotte. The Arbors offers two unique outdoor venues that your guests will remember for years to come. The property was designed to give visitors the full experience of a working tree farm and is open to the public to purchase plants and trees. As you drive along the half mile long road into the nursery, you will pass through thousands of ornamental, evergreen and shade trees. At the end of the road, you will find the Banquet and event sites surrounded by several acres of manicured lawns, perennial gardens and lush landscaping. The Main Site overlooks a three acre pond that is abundant with fish and wildlife. Our second venue, The Pavilion, overlooks a 10 acre field of wildflowers. We invite you to schedule a visit to our nursery to explore the possibility of reserving the farm. The Arbors is ideal for groups of 50 to 350 , the farm offers a picturesque setting for all occasions. Amenities at the Main Site will include a custom built home with an attached 4700 square foot heated and cooled banquet area, a 2 1/2 acre pond, a large dock, huge outdoor living areas with a fireplace and two fire pits. 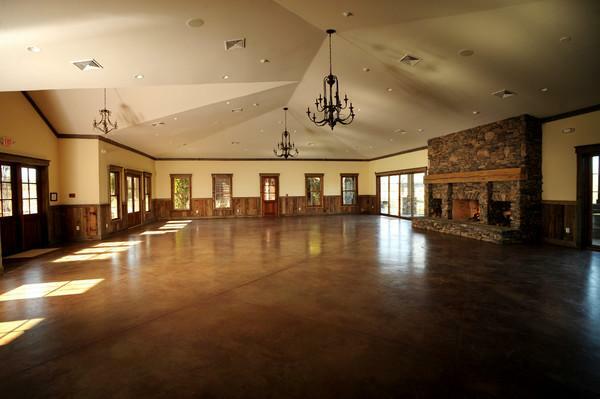 The Pavilion, a brand new 4200 square feet reception facility constructed of stone and cedar shake siding, offers you and your guests the rustic feel of the farm with all of the amenities of a climate controlled banquet hall. At both locations, the photo opportunities are endless with flowering trees, amazing perennial gardens, exquisite landscaping and several acres of wildflowers in bloom throughout the year. The Arbors Events can accommodate corporate groups of 20 to 1000 guests. We specialize in hosting holiday parties, company picnics, seminar training days, team building and corportate retreats. We offer two venues; The Main Venue and The Pavilion. The Main Venue overlooks a three acre pond that is abundant with fish and wildlife. Amenities at the Main include a custom built home with an attached 4700 square foot heated and cooled banquet facility, outdoor living areas adjacent to a field of wildflowers and two fire pits. Inside you will find a massive fireplace, commercial restrooms, a large bar and catering prep area. The Pavilion is a 4200 square foot reception facility constructed of stone and cedar shakes. It offers you and your guests the rustic feel of the farm.